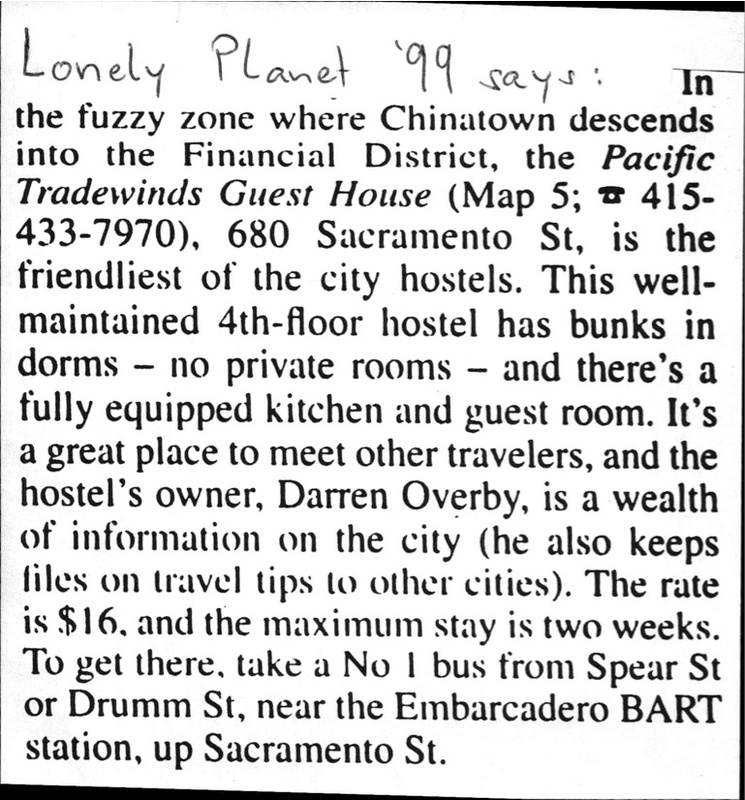 Lonely Planet '99 says: "In the fuzzy zone where Chinatown descends into the Financial District, the Pacific Tradewinds Guest House (Map 5; Tel. no. 415-433-7970), 680 Sacramento St, is the friendliest of the city hostels. This well-maintained 4th-floor hostel has bunks in dorms - no private rooms - and there's a fully equipped kitchen and guest room. It's a great place to meet other travelers, and the hostel's owner, Darren Overby, is a wealth of information on the city (he also keeps files on travel tips to other cities). The rate is $16, and the maximum stay is two weeks. To get there, take a No 1 bus from Spear St or Drumm St, near the Embarcadero BART station, up Sacramento St."
"I only have good words about the hostel. It's by far the best I've been to..."
"Wonderful people, great environment. Would suggest to anyone in the area..."
"Great experience. Arrived just before midnight and had no problem checking in..."
"Those people are the real beautiful ones who appreciate our friendship more..."
"Everything was great. The people were so friendly, the Chinatown location was..."
"The staff were helpful and seemed to have the welcoming/arrival speech down..."